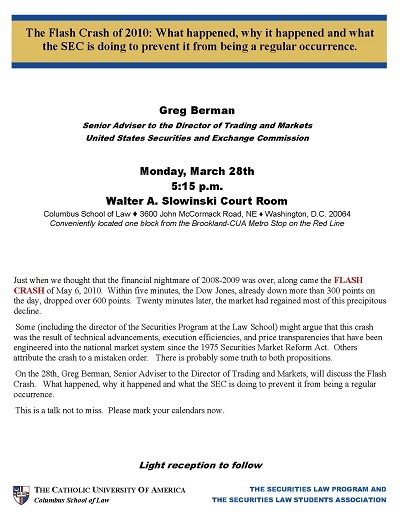 Berman’s address, “The Flash Crash of 2010: What happened, why it happened and what the SEC is doing to prevent it from being a regular occurrence” pointed to the confluence of a number of events that appeared to play a role in the biggest one-day point decline, 998.5 points, in Dow Jones Industrial Average history. Berman, Gregg, "The Flash Crash of 2010" (2011). Securities Law Program Lecture Series. 18.